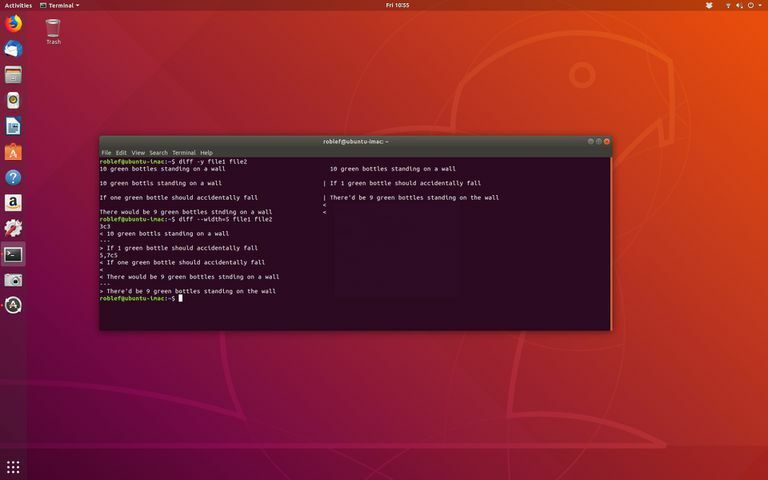 This guide will show you how to use Linux to compare two files and output their difference to the screen or to a file. You do not need to install any special software in order to compare files using Linux but you do need to know how to open a terminal window. As the linked guide shows there are many ways to open a terminal window using Linux. The simplest is to press the CTRL, ALT and T keys at the same time. The command used within Linux to show the differences between 2 files is called the diff command. Initially, the output may seem confusing but once you understand the terminology it is fairly logical. The second file only has three lines whereas the first file has 4. The second file says "1 green bottle" on the third line whereas the first file says "one green bottle"
The output from the diff command shows that between lines 2 and 4 of the first file and lines 2 and 3 of the second file there are differences. It then lists the lines from 2 to 4 from the first file followed by the 2 different lines in the second file. If the files are the same then nothing is displayed. In order to achieve this requirement using the diff command, you can use the following command:. If there are lots of differences then it can very quickly become confusing as to what the differences actually are between the two files. The output for the file uses the | symbol to show a difference between the two lines, a < to show a line that has been removed and a > to show a line that has been appended. Interestingly if you run the command using our demonstration files then all the lines will show as different except for the last line of file 2 which will be shown as having been deleted. When comparing two files side by side it can be hard to read if the files have lots of columns of text. You can find more information by reading the manual for the diff command. The diff command can be used in its simplest form to just show you the differences between 2 files but you can also use it to create a diff file as part of a patching strategy as shown in this guide to the Linux patch command. Another command you can use to compare files is the cmp command as shown by this guide. This compares files byte by byte.